Author(s): Sokhan’ S. V.*, Maystrenko A. L., Kulich V. H., Sorochenko V. H., Voznyy V. V., Gamaniuk M.P., Zubaniev Ye. M.
Sokhan’ S. V. Diamond grinding the ceramic balls from silicon carbide / S. V. Sokhan’, A. L. Maystrenko, V. H. Kulich, V. H. Sorochenko, V. V. Voznyy, M. P. Gamaniuk, Ye. 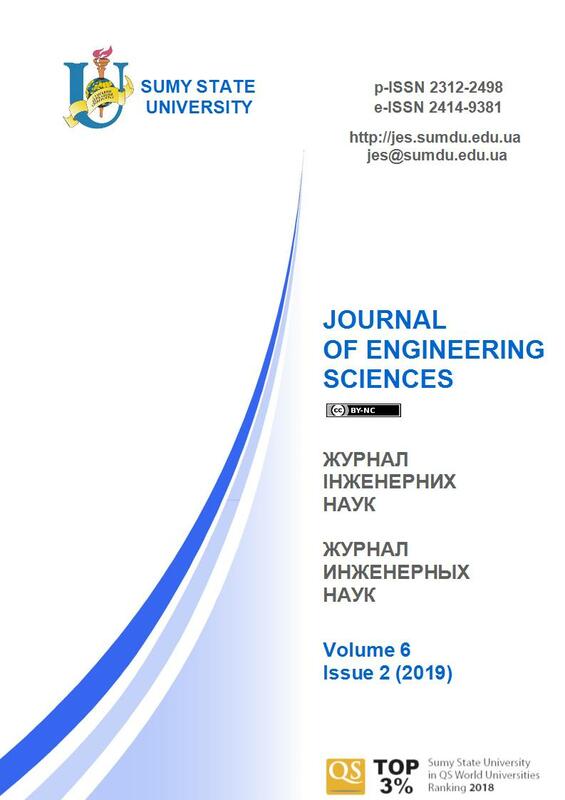 M. Zubaniev // Journal of Engineering Sciences. – Sumy : Sumy State University, 2018. – Volume 5, Issue 1. – P. A12-A20. Abstract: The influence of the machining regime was experimentally investigated on the output indexes of the diamond grinding the ceramic balls from silicon carbide, such as the rate of the material removal and the rate of changing (decreasing or increasing) the deviation from sphericity of the ball’s surface. To distinguish a particle of these indexes as caused by the actual influence of the machining regime was applied a method of graphical approximation of the time-varying ball’s diameter and deviation from sphericity. The separated particles of the process indexes can vary both as growing and as decreasing depending on the values of the parameters of the machining regime, such as: the discrete feeding of the diamond wheel to the cutting, the time of grinding between feedings of the wheel and the rotation speed of the table with the balls. For further determining the influence of the machining regime was applied a method of a complete factor-type experiment of type 23, in which the factors of the above parameters were specified. As a result, the most effective way to reduce the deviation from the sphericity of the ball’s surface is to combine these parameters. Keywords: ceramic balls from silicon carbide, diamond grinding, rate of the material removal, rate of changing the ball’s shape, machining regime, discrete feeding of the diamond wheel to the cutting, time of grinding between feedings of the wheel, rotation speed of the table. Hybrid Ball Bearings. Retrieved from: https://www.bearingworks.com/products/hybrid-ball-bearings.php. Sverhtverdye materialy. Poluchenie e izmerenija. Almazno-abrazivnyy instrument v tekhnolohijah mekhanoobrabotki (2007). Kyiv, Alkon [in Russian]. Pasichnyy, O. O. (2002). Pidvytshennja efektyvnosti pretsezeonnoji almaznoji obrobky detaley typu „kulia” z konstruktsijnoji keramiky. Thesis for the Ph.D. degree. Kyiv, Bakul Institute for Superhard Materials of NAS [in Ukrainian]. Feng, M., Wu, Y., Yuan, & J., Ping, Z. (2017). Processing of high-precision ceramic balls with a spiral V-groove plate. Front. Mech. Eng. 2017, 12 (1), 132–142. Zhou, F., Yuan, J., Lyu, B., et al. (2016). Kinematics and trajectory in processing precision balls with eccentric plate and variable-radius V-groove. The International Journal of Advanced Manufacturing Technology, 2016, 84 (9), 2167–2178. Ma, W. (2013). High efficiency ultra-precision grinding of ceramic balls. Dissertation for the Doctoral Degree. Saga, Saga University. Filatov, Y. D., Vetrov, A. H., Sidorko, V. I., Filatov, A. Yu., & Kovalev S. V. (2013). Zakonomernosti finishnoy almazno-abrazivnoy obrabotki monokristallicheskoho karbida kremnija. Superhard Materials, No 5, pp. 63–71 [in Russian]. Filatov, Y. D., Vetrov, A. H., Sidorko, V. I., et al. (2015). Polirovanije elementov optiko-elektronnoy tekhniki iz monokristallicheskoho karbida kremnija. Superhard Materials, No 1, pp. 63–71 [in Ruissian]. Filatov, Y. D., Filatov, O. Yu., Monteil, G., Heisel, U., & Storchak, M. (2010). Bound-abrasive grinding and polishing of surfaces of optical materials. Proc. of SPIE, Vol. 7786, Art. no.778613. Husev, V. V., & Kalafatova, L. N. (2012). Tekhnolohicheskoje obespechenije kachestva obrabotki izdeliy iz tekhnicheskoy keramiki. Donetsk, DonNTU [in Russian]. Filatov, Y. D., & Rohov, V. V. (1994). Klasternaja model mekhanizma ustalostnoho iznosa SiO2-sodergatshih materialov pri ikh polirovanii instrumentom so svjazannym polirovalnym poroshkom na osnove dioksida tserija. Chapter 1. Superhard Materials, No. 3, pp. 40–43 [in Russian]. Filatov, Y. D. (1991). Mekhanizm obrazovanija mikroreljefa poverkhnosti pri obrabotke stekla. Tam ge., No. 5, pp. 61–65. Morozov, E. M., Zernin, M. V. (1999). Kontaktnye zadachi mekhaniki razrushenija. Moscow, Mashinostroyeniye [in Russian]. Kulich, V. H., Kushch, V. I., Tkach, V. N., Maystrenko, A. L. (2009). K voprosu o vozmognostjakh poluchenija vysokoplotnykh keramicheskikh izdeliy na osnove samosvjazannoho karbida kremnija. Superhard Materials, No. 1, pp. 18–35 [in Russian]. Proverka znachimosti koeffitsientov i adelvatnosti uravnenija regressii, poluchennykh pri obrabotke rezultatov PFE 22 i 23. Retrieved from: https://politeh24.com/4207#more-4207 [in Russian].